Whitby Town are targeting their first FA Trophy win since October 2012, when they travel to Evo-Stik NPL rivals Workington on Hallowe’en Saturday. The Blues tumbled out of the competition at the first hurdle in the past two seasons, losing to sides in the same divisions on both occasions. In 2013, it was eventual champions Chorley who sneaked a 1-0 win at the Turnbull Ground while Ramsbottom United forced a similar victory last season, with a late goal in a 2-1 success. 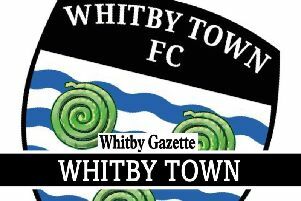 “We only ever seem to get tough draws in the cups,” manager Darren Williams told the Whitby Gazette. “We know the Workington game is going to be a real test on Saturday, but we’re focused on going there and getting a result. “Make no mistake, the FA Trophy is a big one for us, we want to progress in the competition. “We’ve played better in our last two matches and the lads need to go out and apply themselves again. A tidy sum of £2,700 is up for grabs, and if the scores are level on Saturday, there will be a replay at the Turnbull Ground on Wednesday. Workington have already defeated the Seasiders 3-1 at their Borough Park home, where they are unbeaten in league action. Lee Bullock levelled before a second half horror show saw the Blues beaten, earlier this month. Central defender Richard Pell is expected to return, but Town will be without midfielder Dave McTiernan who serves a suspension for two yellow cards at Rushall Olympic recently. There will be fitness assessments on Thibault Charmey and strike duo Mikey Roberts and Matty Waters, who both limped off in the closing stages of Wednesday’s home loss to Blyth. “It’s not ideal being without Macca, and the knocks that Mikey and Matty picked up are a concern,” Williams added.